Single wall Hopper is a job of Stainless Steel Fabrication container used to flow a bulk material such as tablets, capsules, medicine powder, ointment downward and can discharge its contents. A tapering container, working with a hopping motion, through which above material passed into a machine. This is a customize job of SS fabrication made from a Stainless Steel sheet. This hopper was generally fitted on top of the machines. Category: Stainless Steel Fabrication / Hopper Fabrication. Material Detail: Main Body Made by 1.5mm thickness and Products. Contact Parts are made with 1.5 mm thickness & SS 316 quality. Fabrication Detail: Upper part of hopper is a rectangular shape with curved surface, and bottom part is made with narrow oval shape. 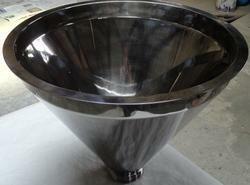 Internal finishing of hopper given mirror and external finishing of hopper is matted or as per customize requirement. Usage: Pharmaceutical, Food Processing, Cosmetic and Packaging Machinery. Looking for Single Wall Hopper ?